There is striking similarity in the predicament that India and Russia face with regard to the situation around Iran. For both, Iran has been and will always remain a key strategic partner. The relationship with Iran never runs smooth for either India or Russia. Iran is a complex country of great sophistication in culture, politics and society and is not an easy partner to understand. Nonetheless, it is one of those pivotal countries with which unless you have a meaningful understanding and cooperation, your overall regional policies remain by far sub-optimal or even ineffectual. The United States never quite regained its rhythm in the Middle East after the fall of the Shah of Iran in 1979. For Russia, shadows of the Iran problem fall on a much larger canvas admittedly than for India, which is only natural since Russia is an established nuclear power that carries the non-proliferation baggage as the ‘white-man’s burden’, belongs to the famous ‘Six-plus-One’ talking shop negotiating with Tehran now and then and which as a permanent member of the United Nations Security Council would, conceivably, have an obligation to monitor the ebb and flow of international security. But for India, Iran canvas is big enough and is probably of even more immediate and vital consequence. Russia is an energy producer and exporter while India is a net oil importer and worries about its long-term energy security. But then, for Russia too, Iran’s profile as an energy exporter is of interest. The most striking similarity, however, is that for both Russia and India, their respective relationship with Iran has become a template of their evolving ‘partnership’ with a third country – United States. The initiative for this unwarranted bonding came from the US, which also set its terms. Washington first tested out its efficacy with India during the second half of the second term of the George W. Bush presidency. India was negotiating the civil nuclear cooperation agreement with the US at that time and the Indian leadership estimated that the deal was extremely important for the country to move on to a higher trajectory on the technological ladder, as the deal promised to whittle down the US’ existing restrictions on transfer of military technology to India. All that Washington needed to do was to link the nuclear deal with the conditionality that India should remain passive over the US’ pressure tactic with Iran on the nuclear issue. The western-oriented Indian elites saw it as a small price to pay – a bargain, almost. Washington might have been taken aback by the ease with which Delhi fell in line. That pleasant experience would have encouraged the Barack Obama administration to subsequently introduce Iran as a vector of the US’s so-called ‘reset’ with Russia. Suffice to say, once again the ‘grand bargain’ worked with remarkable ease. In sum, START and the US-India nuclear deal, were the progenies of the US’s ‘smart power’ of selective engagement with Russia and India. For Russia, START is of no less importance than the nuclear deal is for India. However, the grandmaster turned out to be the ultimate winner. The US used the ‘grand bargain’ with Russia to isolate China and coax Beijing into a more accommodating stance over the Iran issue and in turn it resulted in the current UN sanctions regime against Iran. More important, aside undercutting Russia and India’s traditional ties with Iran, the US also played havoc with the ‘polycentrism’ that all three – Russia, India and China – used to profess in their a priori history as the indispensable gospel of the new world order. The heart of the matter is that the Iran nuclear problem always had a larger-than-life significance. The Iran problem is all about the ABC of the international system. The US’ doublespeak is at once apparent: it camouflages geopolitics as its non-proliferation agenda in the Middle East. 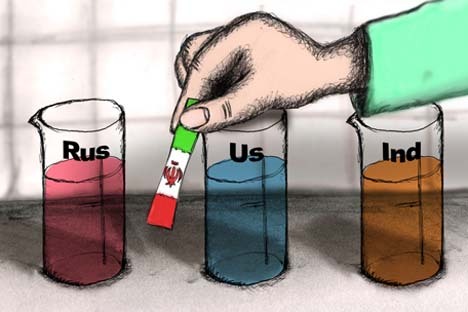 Everyone knows that Iran situation is a litmus test of the end of the ‘unipolar’ era. Paradoxically, while the medium and long-term interests of Russia and India ought to lie in a democratized, polycentric world order that is based on international law, they have bent from the angle of their limited self-interests to accommodate the US-led ‘unipolarity’ when it came to the Iran problem. The shadow play has been useful for the US to not only ‘isolate’ Iran but also to retain the monopoly over conflict resolution in Afghanistan as well as for advancing the agenda of the expansion of the North Atlantic Treaty Organization [NATO] into Central Asia. Its ‘after-shocks’ are still playing out. The ‘grand bargain’ with India has enabled the US to get embedded deeply in the South Asian region, which, incrementally, holds the potential to erode the Russian-Indian partnership itself. Arguably, the ‘erosion’ may already be under way. In the downstream of the nuclear deal, the US has begun dismantling its embargo on transfer of military technology to India and is positioning itself to take a quantum leap replacing Russia as India’s number one partner in military cooperation in a very near future. Therefore, the latest Russian statements at the 47th Munich security conference regarding the situation around Iran have not come a day too soon. Foreign Minister Sergey Lavrov reportedly said, “The sanctions which were approved in June last year, the sanctions aimed at [Iran’s] nuclear programme have been completely exhausted” and any new sanctions would damage the Iranian economy. Deputy Prime Minister Sergei Ivanov reportedly said, “We believe that neither further sanctions, nor intimidation and application of force could be regarded an efficient too to solve these issues” and that the concerns that Tehran may obtain nuclear weapons in the next few years are groundless. The statements by Ivanov and Lavrov are absolutely factual. Iran has withstood the sanctions regime and, in fact, sanctions are working to the advantage of the West and to the detriment of countries like India or Turkey. For instance, under US pressure, following Obama’s visit to India in November, India’s Central Bank decided that the long-standing clearing mechanism for oil trade with Iran can no longer be used, jeopardizing Iran’s 400000 barrels per day of oil exports to India which cover 12% of India’s oil needs. Iran is second only to Saudi Arabia as an oil supplier to India but Iran’s high-sulphur content crude produces a higher percentage of diesel, which is used widely in India’s agriculture sector for machinery and water pumping. India caps diesel prices and the subsidy so far in the current financial year has been 4.63 billion dollars (whereas, the government’s budget allocation is 686 million dollars only). Quite obviously, a new payment mechanism for oil trade between India and Iran urgently needs to be found and meanwhile, with an eagle’s eye, Washington is watching. The West’s hypocrisy is such that, as Bloomberg reported last week, “Europe has been buying crude oil from Iran at a record rate, even as it imposes sanctions against the Middle East country for its nuclear programme.” Europe’s imports of Iranian crude rose by 39 percent in the first 9 months of last year, according to the data from the International Energy Agency [IEA]. European countries of the Organization for Economic Cooperation and Development, excluding Hungary, imported an average of 763,333 barrels a day of Iranian Heavy and Iranian Light Crude in the third quarter of 2010, according to the IEA. Bloomberg reports: “By contrast, China, criticized for not doing enough to help restrain Iran’s nuclear ambitions, cut imports by 11 percent in the same period”. Actually, the European refineries are having a ball by making cheap crude purchases from Iran while the US struts around like a vigilante imposing ‘sanctions’ on non-Europeans like the Indians or Turks. Delhi is yet to figure out a way to be assertive about India’s sovereignty when it comes to the Iran problem. This is not going to be simple since new factors have come into play – US support for India’s bid for permanent membership of the UN security council, possibilities opening up for India to access military technology from the US, etc. Nonetheless, abandoning the UN sanctions route on the Iran issue will go a long way to ‘normalise’ the state of play. Much depends, therefore, on Russia’s new thinking to oppose sanctions against Iran. If it sticks to the principled position and assesses the US-Iran standoff for what it is essentially, namely a geopolitical shadow play, the fallout could be beneficial for many countries. India’s Reliance Industries might, hopefully, muster courage to resume sales of refined petroleum products to Iran. So may Turkey’s Tupras or Kuwait’s Independent Petroleum Group. Why? Even Russia’s Lukoil may resume sales to Iran.